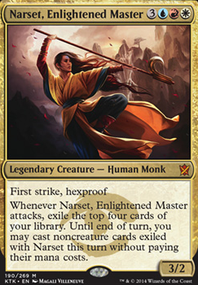 Cromat - I ran him as my original commander, but found that I was rarely keeping mana open to activate his abilities since I was casting a planeswalker per turn. Progenitus - My second commander was more intimidating, but rarely impacted the game in time. The game was usually decided before turns 8-10. Child of Alara - Wraths my planeswalkers, so this baby was a no-go. Sliver Hivelord - An indestructible 5/5 for 5 seemed like a good deal considering I was running a ton of boardwipes at the time. The addition of Spreading Plague made this guy a wrath in of himself. He's stuck around ever since. Card draw was heavily emphasized because there is not a whole lot of ways to draw cards in this heavily thematic deck. Another minor trait worth consideration is whether or not the planeswalker can immediately Ult when a Doubling Season is in play. Originally the deck was creatureless as to remain a pure "all-planeswalker" EDH deck. But competitiveness in my playgroups drove the deck to include some high-efficiency creatures like Bloom Tender and Narset, Enlightened Master. More recent additions have increased the creature count a bit higher, but the deck still eschews creature cards for planeswalker cards when possible. Most Oaths are included as on-theme support cards with the added benefit of being quality Venser, the Sojourner targets. Spreading Plague is a pet card of mine that really should be cut, but my playgroups continue to struggle to deal with it, often forfeiting two or three turns trying to come up with an answer. Humility & Ensnaring Bridge are great at slowing down the late game decks and can buy you several turns to flood the board with planeswalkers. Winning with planeswalkers is not an easy feat. While they can generate a sizeable value advantage through their abilities, rarely are those advantages enough to steal a game away from a deck that can combo to win. Your boardstate is slow to build (often at the rate of one-planeswalker per turn) and can be easily obliterated by a Cyclonic Rift or All Is Dust. Unfortunately players often overly-assess the threat of planeswalkers, often worrying about the strength of the Ult regardless of its loyalty. This causes planeswalkers to draw attention away from other threats unduly. Players who are usually reserved about attacking players in multiplayer games (i.e. often roll a dice to determine randomly who they are to attack) will remorselessly attack a defenseless planeswalker. Because of this, it is often more beneficial to slow-play an already painfully slow deck. Following up an opponents board-wipe with a planeswalker which can create a token is a great way to establish a foothold to build upon. Often your main contributions to the early game will be to boardwipe faster decks and reset them to scratch on turn 4 - right about when your good walkers will compete for boardstate. The easiest way to win with walkers is to resolve land destruction spell when you have a few strong walkers in play. Jokulhaups is great because it destroys most creatures in addition to lands (except indestructible creatures like your commander) leaving your planeswalkers in a vacuum which they can quickly take over with their abilities. The other way to win is to simply flood the game with walkers. Once you're able to cast two-per-turn (maybe you've survived to 8 mana or you have a Bloom Tender churning out WUBRG) your opponents will struggle to kill walkers faster than you can play them. If they're unable to kill walkers fast enough, maybe because you have blockers, boardwipes, Humility, or Ensaring Bridge, your boardstate will snowball into a monstrosity that will usually force the pod to concede (especially due to exceedingly complex and lengthy turns). A win is a win! Overall the deck is a lot of fun to play and sates my Timmy hunger for Archenemy 1 v 3s with impressive boardstates.